All Indians home games will be televised during the 2010 season. INDIANAPOLIS -- For the first time in Indianapolis Indians history, the Tribe will televise all 72 home games in 2010. The live telecasts will air on Comcast and Bright House Networks as a part of HomeTown Sports Indiana programming on digital channel 81 on both networks. The home schedule begins on Friday, April 16 at 7:15 p.m. as the Indians face the division-rival Toledo Mud Hens. 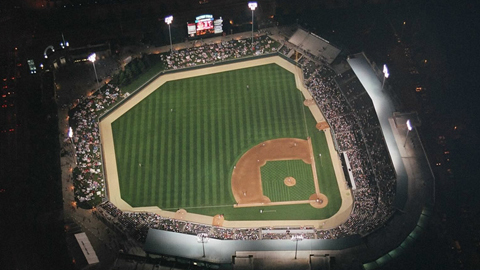 "We are very excited about the exposure this will give Indians Baseball at Victory Field," said Cal Burleson, Vice President and General Manager of the Indianapolis Indians. "These telecasts will show people having a great time experiencing Professional Baseball at the best minor league ball park in America. We will continue to communicate that Indians Baseball is affordable, and close to home for those who will be in the viewing audience. The enticement to come and see us will be brought right into people's living rooms." The unique cable television partnership will also include Indianapolis Indians On Demand programming. Fans will be able to view game highlights as well as exclusive player interviews and team features. "With the availability of Indianapolis Indians programming live and On Demand, we're bringing our Hoosier customers more access to their home team than ever before," said Scott Tenney, Senior Vice President of Comcast's Indianapolis region. "Comcast is committed to delivering our customers the best in local sports programming, and we're excited to be providing Indianapolis Indians On Demand for fans to enjoy whenever and as often as they want." Howard Kellman, who is in his 35th year as radio play-by-play "Voice of the Tribe," and Scott McCauley, who is in his fifth season with the Indians broadcast team, will call the action as a part of a simulcast with WXLW-950, the radio home of Indians baseball. Kellman was Indiana's 2002 Sportscaster of the Year and was inducted into the Indiana Sportswriters and Sportscasters Association Hall of Fame in 2009. He has also served as the lead announcer for ESPN's coverage of Triple-A Baseball's Championship Game. McCauley spent parts of seven seasons as a Minor League Baseball broadcaster with the South Bend Silver Hawks (2000-01), Akron Aeros (2002) and Dayton Dragons (2004-05) and hosted "The Meltdown" and "Indy College Gameday/Tip-Off" on ESPN-950 before joining the Tribe in 2006. McCauley is also the play-by-play voice of IUPUI men's basketball. "The Indianapolis Indians organization has such a rich history and enjoys a large, loyal and distinctive fan base throughout central Indiana," said Wayde Klein, Vice President of Marketing and Customer Operations for Bright House Networks Indiana. "Bright House Networks strives to give our customers the local sports programming they want when they want it. We're excited to be able to air all of the Indians' home games on Channel 81 this season and complement the live games with On Demand content, Channel 600 that Indians fans can watch and enjoy any time they choose." The telecasts will be produced by Indianapolis-based WebStream Productions. WSP has produced live Web streams of Indians games on IndyIndians.com for the past six seasons and produces live video for the NCAA, the Horizon League Network and the Missouri Valley Conference. Comcast Corporation (Nasdaq: CMCSA, CMCSK) (www.comcast.com) is one of the nation's leading providers of entertainment, information and communication products and services. With 23.6 million cable customers, 15.9 million high-speed Internet customers and 7.6 million Comcast Digital Voice customers, Comcast is principally involved in the development, management and operation of cable systems and in the delivery of programming content. Comcast's content networks and investments include E! Entertainment Television, the Style Network, the Golf Channel, VERSUS, G4, PBS KIDS Sprout, TV One, 11 regional sports networks operated by Comcast Sports Group and Comcast Interactive Media, which develops and operates Comcast's Internet businesses, including Comcast.net (www.comcast.net). Comcast also has a majority ownership in Comcast-Spectacor, which owns two professional sports teams, the Philadelphia 76ers NBA basketball team and the Philadelphia Flyers NHL hockey team, and a large, multipurpose arena in Philadelphia, the Wachovia Center, and manages other facilities for sporting events, concerts and other events. Bright House Networks is the ninth-largest multichannel video programmer distributor in the U.S. with 2.4 million customers in cities including Tampa Bay and Orlando, Fla.; Bakersfield, Calif.; Indianapolis; Detroit; and Birmingham, Ala.; along with several other smaller regions in Alabama and the Florida Panhandle. The Florida markets are adjacent and form one of the country's largest cable clusters. Bright House Networks is committed to putting customers in control and making their lives easier with products including Digital Cable, High-Speed Internet and Home Phone. The company also provides an ever-expanding catalog of Video on Demand programming, popular Digital Video Recorders (DVR), and high-definition (HD) programming. Exceptional customer care is the cornerstone of Bright House Networks' business and a top priority across all operating units. Bright House Networks was ranked the "Highest in Residential Telephone Customer Satisfaction in the South Region" by J.D. Power and Associates in 2006, 2007, 2008 and 2009. J.D. Power and Associates also ranked Bright House Networks the "Highest in Customer Satisfaction Among High-Speed Internet Service Providers in the South Region" in 2008 and 2009. In addition to its residential services, Bright House Networks Business Solutions (www.brightbiz.com) provides products and services, including Business Phone, Internet, Managed Security Services, Web Services and Wireless Solutions, for small, medium, and enterprise businesses. For more about Bright House Networks, visit www.brighthouse.com.